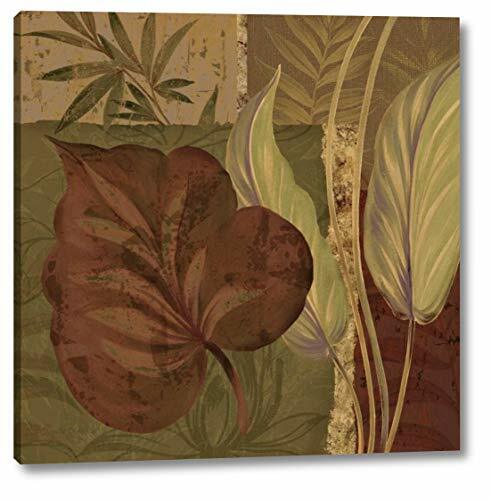 This 20" x 20" premium giclee canvas art print of Tropical Foliage I by Pamela Gladding is created on the finest quality artist-grade canvas, utilizing premier fade-resistant archival inks that ensure vibrant lasting colors for years to come. Every detail of the artwork is reproduced to museum quality specifications by our talented graphic artists. This magnificent canvas print is gallery wrapped by one of our professional framers on 1.5 inch deep wooden stretcher bars. The gallery wrap process allows you to hang the artwork on your wall frameless, since the printed border is wrapped around all four edges. Your gallery wrapped canvas print will arrive to your door ready to hang with all necessary hanging hardware. Canvas Art USA brings your walls to life with our meticulous attention to detail, all backed by the best customer service in the biz. 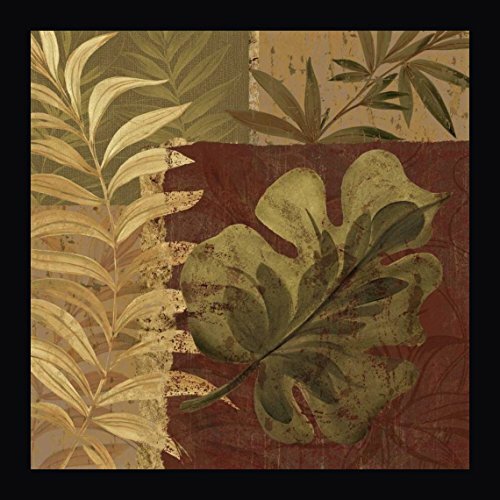 This 40" x 40" premium giclee canvas art print of Tropical Foliage II by Pamela Gladding is created on the finest quality artist-grade canvas, utilizing premier fade-resistant archival inks that ensure vibrant lasting colors for years to come. Every detail of the artwork is reproduced to museum quality specifications by our talented graphic artists. This magnificent canvas print is gallery wrapped by one of our professional framers on 1.5 inch deep wooden stretcher bars. The gallery wrap process allows you to hang the artwork on your wall frameless, since the printed border is wrapped around all four edges. Your gallery wrapped canvas print will arrive to your door ready to hang with all necessary hanging hardware. Canvas Art USA brings your walls to life with our meticulous attention to detail, all backed by the best customer service in the biz. 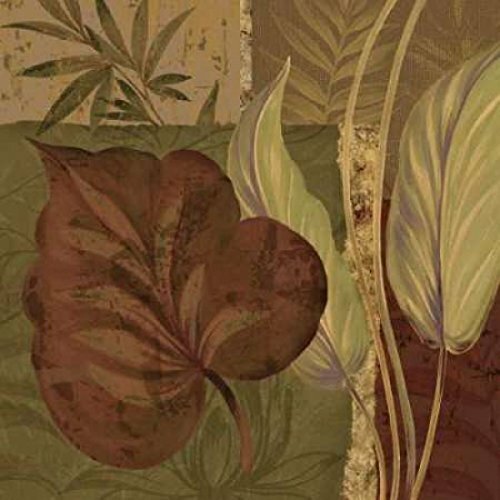 Tropical Foliage II is a licensed reproduction that was printed on Premium Heavy Stock Paper which captures all of the vivid colors and details of the original. The overall paper size is 24.00 x 24.00 inches. This print is ready for hanging or framing and would make a great addition to your home or office decor. Tropical Foliage I is a licensed reproduction that was printed on Premium Heavy Stock Paper which captures all of the vivid colors and details of the original. The overall paper size is 12.00 x 12.00 inches. This print is ready for hanging or framing and would make a great addition to your home or office decor. 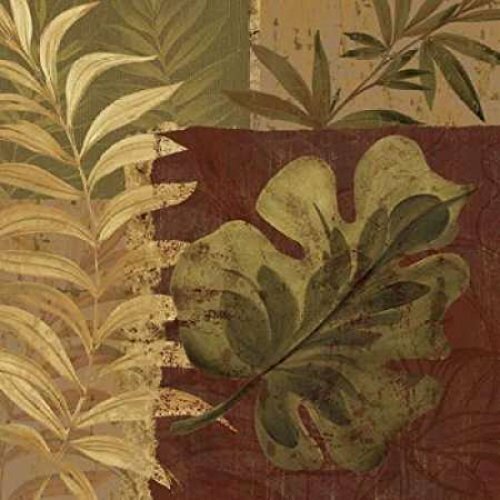 Tropical Foliage II is a licensed reproduction that was printed on Premium Heavy Stock Paper which captures all of the vivid colors and details of the original. The overall paper size is 12.00 x 12.00 inches. This print is ready for hanging or framing and would make a great addition to your home or office decor. 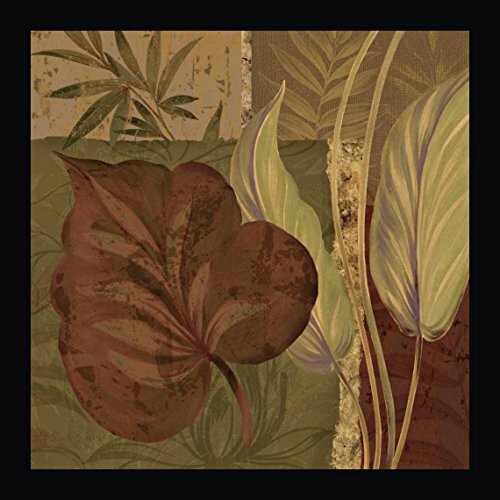 This 24" x 24" framed giclee art print on canvas of Tropical Foliage I by Pamela Gladding is created on the finest quality artist-grade canvas, utilizing premier fade-resistant archival inks that ensure vibrant lasting colors for years to come. Every detail of the artwork is reproduced to museum quality specifications by our talented graphic artists. This magnificent canvas print is custom framed by one of our professional framers in a 2" wide black frame for that ultimate designer look. Your framed canvas print will arrive to your door ready to hang with all necessary hanging hardware. Our huge selection of over 150,000 magnificent works of art, along with an exclusive collection of handcrafted frames, makes Canvas Art USA your one stop source for the finest art for sale at direct wholesale prices. 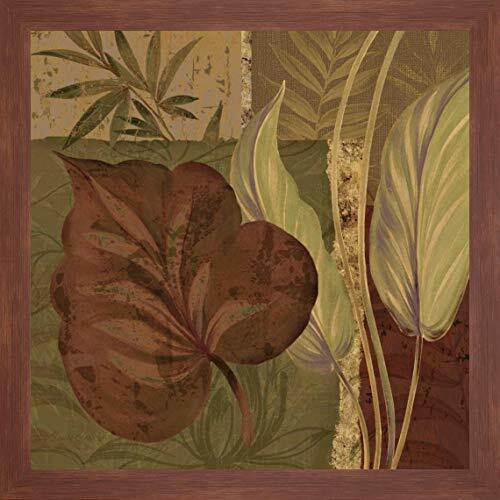 This 34" x 34" framed giclee art print on canvas of Tropical Foliage II by Pamela Gladding is created on the finest quality artist-grade canvas, utilizing premier fade-resistant archival inks that ensure vibrant lasting colors for years to come. Every detail of the artwork is reproduced to museum quality specifications by our talented graphic artists. This magnificent canvas print is custom framed by one of our professional framers in a 2" wide black frame for that ultimate designer look. Your framed canvas print will arrive to your door ready to hang with all necessary hanging hardware. Our huge selection of over 150,000 magnificent works of art, along with an exclusive collection of handcrafted frames, makes Canvas Art USA your one stop source for the finest art for sale at direct wholesale prices. 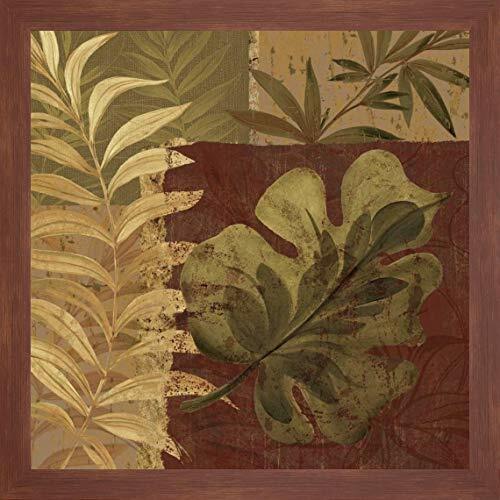 This 34" x 34" framed giclee art print on canvas of Tropical Foliage I by Pamela Gladding is created on the finest quality artist-grade canvas, utilizing premier fade-resistant archival inks that ensure vibrant lasting colors for years to come. Every detail of the artwork is reproduced to museum quality specifications by our talented graphic artists. This magnificent canvas print is custom framed by one of our professional framers in a 2" wide walnut frame for that ultimate designer look. Your framed canvas print will arrive to your door ready to hang with all necessary hanging hardware. Our huge selection of over 150,000 magnificent works of art, along with an exclusive collection of handcrafted frames, makes Canvas Art USA your one stop source for the finest art for sale at direct wholesale prices. 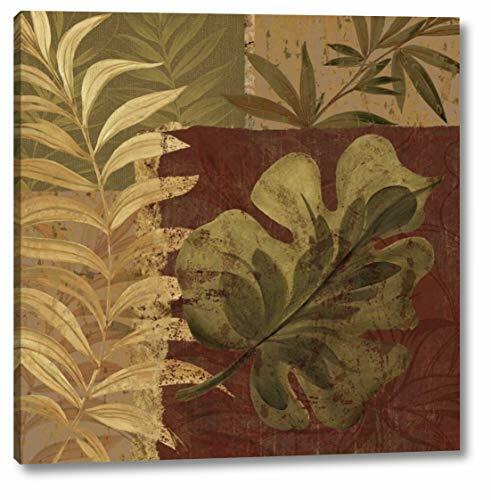 This 28" x 28" framed giclee art print on canvas of Tropical Foliage II by Pamela Gladding is created on the finest quality artist-grade canvas, utilizing premier fade-resistant archival inks that ensure vibrant lasting colors for years to come. Every detail of the artwork is reproduced to museum quality specifications by our talented graphic artists. This magnificent canvas print is custom framed by one of our professional framers in a 2" wide walnut frame for that ultimate designer look. Your framed canvas print will arrive to your door ready to hang with all necessary hanging hardware. Our huge selection of over 150,000 magnificent works of art, along with an exclusive collection of handcrafted frames, makes Canvas Art USA your one stop source for the finest art for sale at direct wholesale prices. Looking for more Pamela Gladding Tropical Foliage similar ideas? Try to explore these searches: Boots Cowboy Boots, Echo Stand, and Bird Tree Ornaments. Look at latest related video about Pamela Gladding Tropical Foliage. Shopwizion.com is the smartest way for online shopping: compare prices of leading online shops for best deals around the web. Don't miss TOP Pamela Gladding Tropical Foliage deals, updated daily.